Vintage One: 20 years of Mtn Bike passion and counting. : Rain, Rain...Go Away??? Not if you are Buddy Steve, then you relish the chance to ride in it. Sick man. 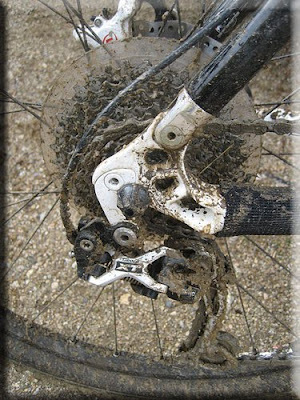 But he talked a few of us into joining him in a local ride that is mostly sandy soil, so the ride was not going to be an exercise in cleaning out nooks and crannies of bikes and cleats with sticks just to keep rolling. The were 4 of us: Myself, Tony The Tiger, Navy Mike, and Buddy Steve. Steve is lucky if not anything else, as the rain gave us a window of relief for the time we rode, then cranked back up again as we were leaving. 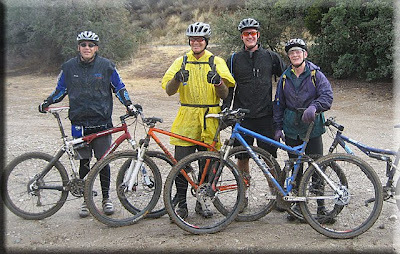 Still, I had to post the pics just to show that we actually ride in wet conditions in So Cal (if we want to...no rain today in the forecast). 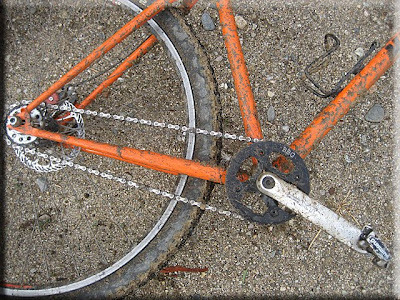 Buddy Steve was concerned about his autograph from Gary Fisher washing off his bike frame. He moves in lofty circles, that Steve. 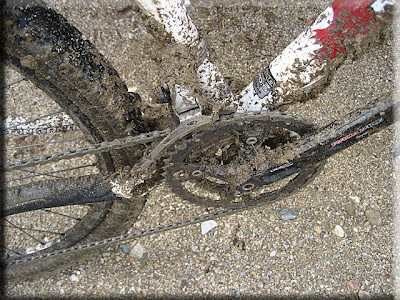 Another thing about rain/mud rides...singlespeeds rule, geared bikes drool. Or squeak, or ping and pop, or grind away expensive parts. The price paid for all the eezy-peezy-nofuss-no-muss riding and clean up on the SS was the crazy hard workout pedaling the one gear up carpet padding-like dirt surfaces that sucked the life out of me. You know the movie, The Princess Bride, where the torture chamber has the 'life sucking machine' that Wesley AKA Dread Pirate Roberts is hooked to? Well, it was kinda like that, only wet. I think I lost a significant amount of years to that life sucking sandy hillclimb. Thanks for the fun. See ya next winter...if I still have that much time left. 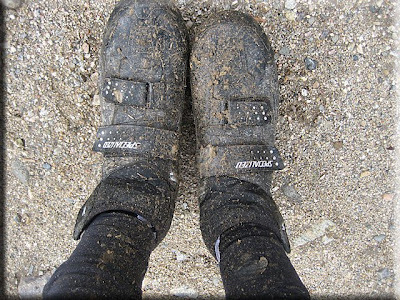 By the way, the Specialized Defroster shoes rocked! No wet feet. Thanks, Boys! Motley Crew group shot. Christmas is in the bag. Tubelessness can be a journey. A Siren Bikes Holiday wish! Who do we thank for this improvement?